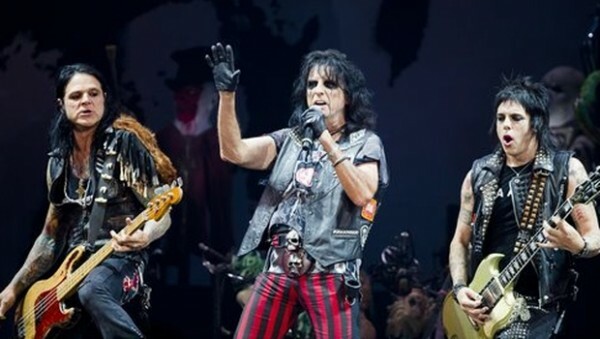 Alice Cooper, “The Godfather of Shock Rock”, recently brought his classic anthems and wild showmanship to Brooklyn, New York’s Barclays Center, opening up the final tour of headliners, Motley Crue. While the Crue put on a spectacle of their own, with fire, explosions, rising platforms and an amazing drum rollercoaster for Tommy Lee, there is no denying that Cooper is the king of darkness when it comes to combining theatrics and rock ‘n’ roll. Influencing everyone from Kiss and Rob Zombie to Marilyn Manson, the Flaming Lips and Motley Crue themselves, Cooper puts on a show like no other, and has been doing it for the better part of four and a half decades. He, along with his original bandmates, were deservedly inducted into the Rock and Roll Hall of Fame in 2011, an honor that was long overdue. While none of Cooper’s original band, who all go back to their high school days in Arizona, tour with him any more, his current band, featuring three guitarists, including the beautiful Nita Strauss, have got the bloody chops down to the bone. Cooper came with all his iconic trademarks, from the eyeliner and top hat to the boa constrictor draped around his shoulders. The show kicked into high gear early on with No More Mr. Guy, Cooper’s light-hearted answer to all the criticism thrown his way over his persona and stage show in his early career. Ironically, Cooper’s songs and performances have stayed away from devil worship, Satanism and all the imagery that normally brings such venom and hate from judgmental religious groups. Indeed, it was Motley Crue which featured a fiery pentagram as a backdrop, while Alice Cooper sported more ‘traditional’ and harmless horror elements, like blood and decapitated heads. The second half of the show is where the theatrics really took off, and had many highlights, one occurring during the song, Feed My Frankenstein. Here, Alice is strapped onto a gurney, electrocuted, and then, amidst everything covered in smoke, emerges as a hulking, giant 15-foot version of himself stomping around the stage. 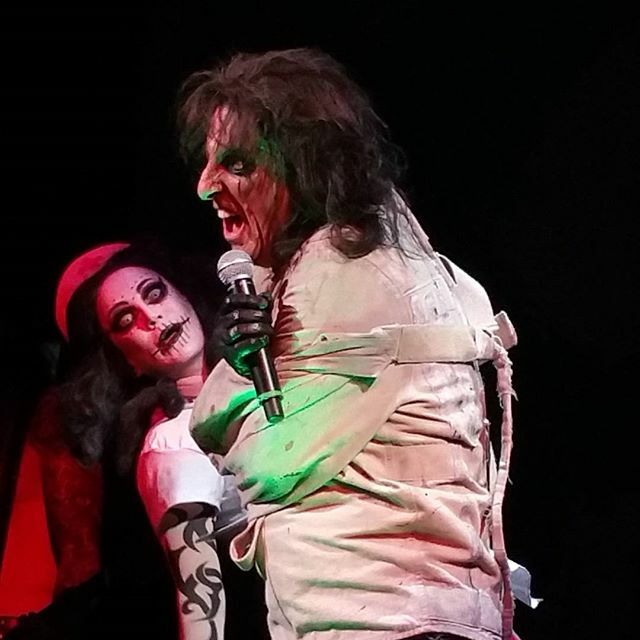 During Battle of Dwight Fry, about an inmate in an insane asylum, and drawing inspiration from the actor who portrayed Renfield in the original Bela Lugosi Dracula, Alice is brought onstage by a psycho zombie nurse (who appears throughout the night.) It is here where the audience is witness to Alice’s most memorable staging as he is placed in a guillotine and his head is lopped off, which the nurse then grabs and parades around the stage displaying it dripping in blood for all the world, or at least those in the arena, to see. It never fails to impress. Other highlights of the night were the quintessential anthem of youthful rebellion, I’m Eighteen and one his biggest hits, the ultimate ‘dangerous woman’ song, Poison. The setlist ended with Cooper’s ode to summer, School’s Out, with everyone in the crowd singing along to the killer chorus, “School’s out for summer…..school’s out for-ever!” It was a great way to end the night. Though the night wasn’t over – we still had Motley Crue! Though Alice Cooper (His real name is Vincent Furnier. He adopted his band’s name early on and has been known as Alice Cooper ever since.) may amazingly be 67 now, you’d never know it seeing the energy and sheer power he possesses on stage. His voice sounds great and his band brings all his classic riffs and choruses to life, and death. No musical artist combines the horror and humor like Alice Cooper, with anthem after anthem that stand the test of time. 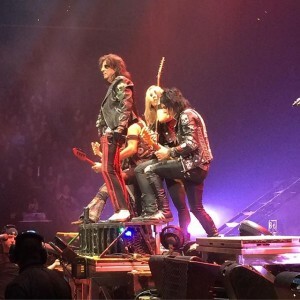 You can still catch him on the road with Motley Crue, and while the Crue are wrapping things up, apparently for good, Alice Cooper shows no signs of ending things any time soon. 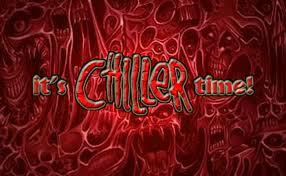 For fans of the original Alice Cooper Band, the three surviving members (other than Cooper himself, and their original lead guitarist, Glen Buxton, who died in 1997), will be appearing at this October’s Chiller Theatre, in Parsippany, NJ. Original members, and Rock and Roll Hall of Fame inductees, Michael Bruce (rhythm guitar), Dennis Dunaway (bass) and Neil Smith (drums) will all be there to sign autographs and take photos. They’ll also no doubt join The Dead Elvi on stage Saturday night for what promises to be a rockin’ night.